The Information Technology sector is layering into interacting industries. RealIT is one layer. Consumers buy Real IT (products or) services in retail market. Often they skip RealIT in the value chain. The next layer is RealIT: using technology to steward and use information to operate (or support the operation of) an organisation. It's the core of what we typically think of as "IT". 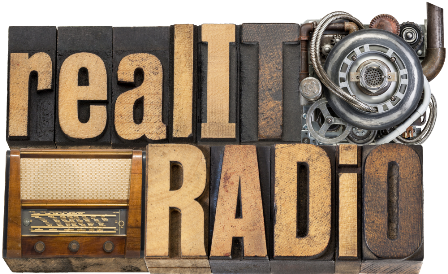 RealIT operates as a sourcer and integrator of services. Currently it also acts as a manufacturer and supplier of many IT services though this will become less so in future thanks to XaaS, a.k.a outsourcing. RealIT can function as a low-cost Sourcer or a high-value Innovator (as Charlie Araujo lays out so well in The Quantum Age of IT). Ignore some of the pundits: all organisations will have an internal IT function forever. Somebody somewhere will have responsibility for overseeing and governing the information and its technology, just as they do for HR, finance, or facilities. Somebody will be doing RealIT. The next layer is the service aggregators/outsourcers/resellers who offer a commercial model for IT supply to organisations. Note: there is much talk about how our colleagues, "the business", will go to suppliers directly to get IT. This is an astonishing failure of corporate governance of IT to allow this to happen, though it is happening often enough. We don't allow business units to go arrange their own finance willy-nilly, nor should we allow them to arrange IT, for the same reasons. The bottom layer is the manufacturers of IT products and services. Many manufacturers also act as suppliers: e.g. hardware and software vendors sell direct. 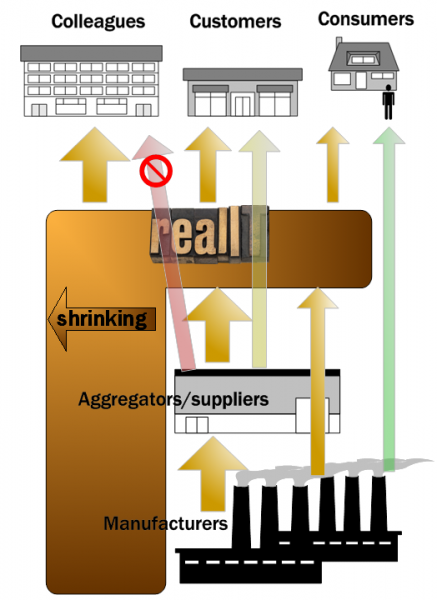 As aggregation-as-a-service grows, we'll see more of them separated by a layer from Real IT. There is some overlap with the retail consumer sector: e.g. companies buy computers and phones. When people talk about IT these days the term is - as usual - becoming debased to mean any or all of these. That's why I have started refering to RealIT: to focus on the reality of applying IT to business/enterprise/organisational outcomes; to take us away from confusing RealIT with the consumer personal digital experience (the right-hand arrow direct from manufacturer to consumer - think Apple - is NOT Real IT, the rules are different) or with the specialist industries of IT service aggregators/outsourcers/suppliers, or IT manufacturers/startups/entrepreneurs/vendors ... all of which are hijacking and distorting the "IT" conversation away from RealIT. RealIT isn't always about speed; the hysterical frenzy of the startup or of the retail technology vendor. RealIT isn't always about innovation or competitiveness. RealIT isn't always about novelty and attractiveness and pandering to the desires of the users. These are viewpoints which are more important in the other parts of the value chain. RealIT is about balancing the conflicting duties of "To Protect and Serve": acting as custodian of the massive existing investment in information and its technology, whilst also serving the changing needs of the organisation.